Here's their home page to do your own searching. These are the areas they cover. Here are the topics from their latest email. About half of American adults lived in middle-income households in 2016, according to a new analysis of government data. Use our updated income calculator to find out which income group you are in and see how you compare with other adults in your area and across the nation. Around three-quarters (74%) of Facebook users say they have taken at least one of three actions in the past year: adjusting their privacy settings, taking a break from checking the platform, or deleting the app from their phone. From pre-kindergarten to 12th grade, a projected 50.7 million students are returning to U.S. public school classrooms this fall. They comprise a student body that is more racially and ethnically diverse, more likely to graduate from high school and more likely to go on to college than in the past. Don't know why you're surprised by that. I'd have put you as a confirmed 1% er. Did some research on a few states recently using IRS returns by zip. There were a good deal more returns above $200k. than I had imagined. Granted, they were joint filings, but 10-12% still surprised me. and for 2017 i didnt get ANY return .. 2016 yes cos of the business but T screwed me over in 017 with his new Tax break legislation.. I am too small of a fish to swim in that lake ... which means a solution for that problem would be to get bigger? Sunday’s general election in Sweden extended two trends that are now prominent across Western Europe: the rise of right-wing populist parties and the decline of center-left parties. 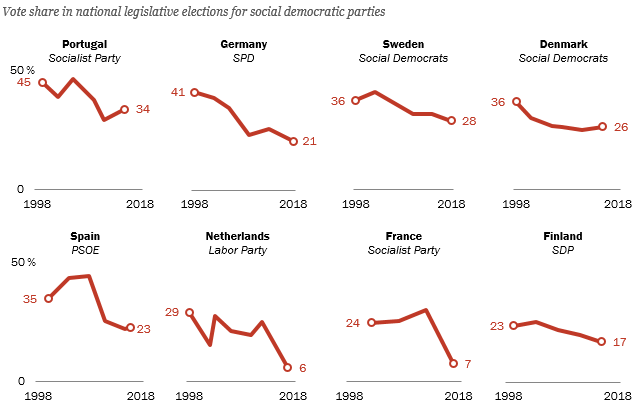 In several countries, center-left parties have hit record or near-record lows in their most recent legislative election results. This is a crucial difference between US and EU immigration. 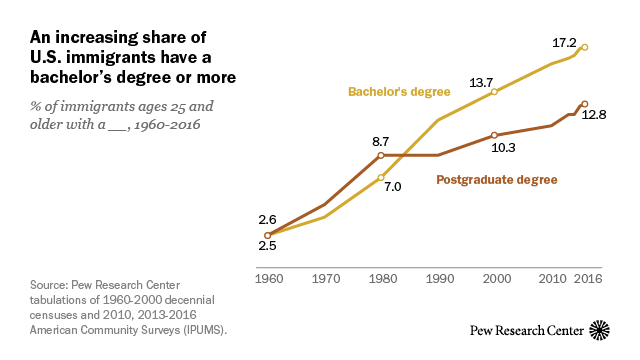 The estimated 44 million immigrants in the United States are better educated than ever before, due in part to rising levels of schooling in many of their home countries and an influx of high-skilled workers to the U.S. in recent years, especially from Asia. Many Americans see the future crowding into the present and some of the innovations ahead unnerve them, especially as they reshape ideas about human dominion. Researchers Cary Funk, Lee Rainie and Aaron Smith round up Pew Research Center findings on Americans' views of advances in robotics, artificial intelligence and biomedical innovations for Scientific American. As economies around the world have gradually recovered from the Great Recession, there has been a dramatic improvement in the global public's economic mood. But more positive feelings about the current economy have not erased concern about the future, and there is a sense in many nations that average people are worse off than 20 years ago. Three years after a record 1.3 million migrants sought asylum in Europe, majorities of people in several European countries support taking in refugeeswho are fleeing violence and war. Yet there is widespread disapproval of how the European Union has handled the refugee issue. About 2 million migrants have arrived in Europe by crossing the Mediterranean Sea since 2009, and the paths they take to get there have changed over time. So far in 2018, the Morocco-to-Spain corridor has been the most traveled of the three major sea routes that migrants use to reach Europe. A Danish law that took effect in August makes it illegal for Muslim women to wear face-covering veils in public, and other European countries have passed similar legislation. The laws are generally in line with public opinion in the region, where most non-Muslim adults favor at least some restrictions on Muslim women’s clothing. Today, the U.S. is home to more immigrants than any other country in the world, accounting for about one-fifth of the world’s migrants in 2016. Learn more about this immigrant population. That's interesting, 40 million sounds like a huge amount but as a percentage ( 12.5% ) of a country with a population of 320+ million it's a quite normal figure for a Western country. Even the ROI with only a decade or two of serious immigration has hit close to 20% of population being foreign born at times. 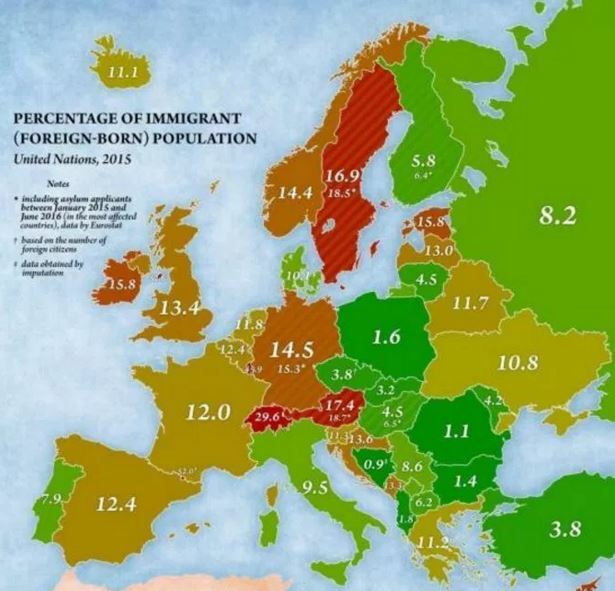 Migration: Ireland has the highest share of nationals living abroad of the 34 mainly developed member countries of the Organisation for Economic Cooperation and Development (OECD): more than 17% of Irish-born persons aged 15 and over, lives overseas. The share of foreign-born persons living in Ireland is also very high, reaching 20% of the total population, following a sharp increase over the years 2001 to 2011. That is very interesting. It's a big change in the last 30 years, for Ireland. Up until the 60s it was one way emigration and persistent population decline. EU membership I presume is a big factor in this (increased numbers in work here). Britain has voted for decline, basically. Not to detract from Ireland's Im/Em turnaround................which was driven in no small part by the jobs created by US FDI. Look what happened to Merkel when she admitted 1M refugees in one year on temporary status. US admits 1M on permanent status every year. As I've noted before, if all of the annual 7-8M applicants since 1963 had been admitted to the US, and each had 1.5 kids the US population today would be north of 850M. Only 150 years ago the US population was just over 30M. India & China took a couple of thousand years to get to their current size. It's a remarkable feat accomplished with relatively little negative impact. As the second anniversary of U.S. President Donald Trump’s election approaches, a new 25-nation Pew Research Center survey finds that Trump’s international image remains poor, while ratings for the United States are much lower than during Barack Obama’s presidency. Across the globe, new technologies are transforming the nature of work. Advances in robotics and artificial intelligence are displacing jobs in manufacturing and, increasingly, in the service sector. And while automation may boost productivity and overall economic growth, there is a recognition that it will also disrupt the workplace, with repercussions for workers, employers, education systems and governments. The general election in Sweden extended two trends that are now prominent across Western Europe: the rise of right-wing populist parties and the decline of center-left parties. The far-right Sweden Democrats entered parliament for the first time in 2010, winning 6% of the vote. This month, they finished in third place with 18% of the vote. And while the center-left Social Democrats finished ahead of the Sweden Democrats, they registered their worst electoral performance in more than 100 years. 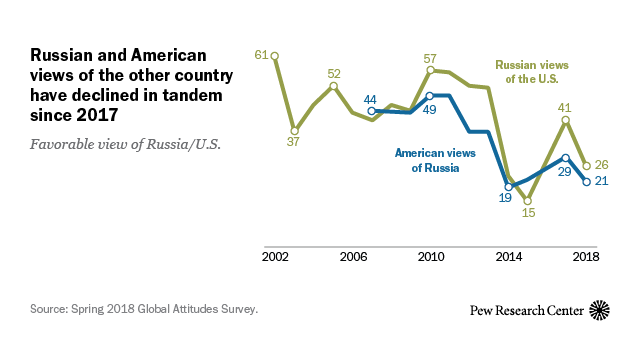 Only 26% of Russians now have a favorable view of the U.S., down from 41% in 2017. Just 21% of Americans see Russia favorably. There is little confidence among both Americans and Russians in the ability of the other nation’s president to do the right thing regarding world affairs. In a significant trend for politics, almost half of 6- to 21-year-olds in the U.S. are Hispanic, African-American, or Asian, according to a study by Pew Research, Axios' Stef Kight reports. Why it matters: Rapidly changing American demographics will have a profound impact on elections, government policies, economic opportunity, and more. "How we deal with this racially diverse generation ... will say a lot about how successful we will be as a nation," says Brookings' William Frey, author of the book "Diversity Explosion." The political impact of changing U.S. demographics can already be seen in the high turnout of young Americans in the midterm elections, Frey tells Axios — an estimated 31% of people 18 to 29 voted, the most since 1994. For Republicans, the threat is that younger generations — more likely to care about abortion, gay rights, and immigration — will flock largely to Democrats. The most notable change has been the rise in the share of Hispanics. A quarter of the post-millennial generation is Hispanic, according to Pew, a growth of 7 points since millennials were their age.